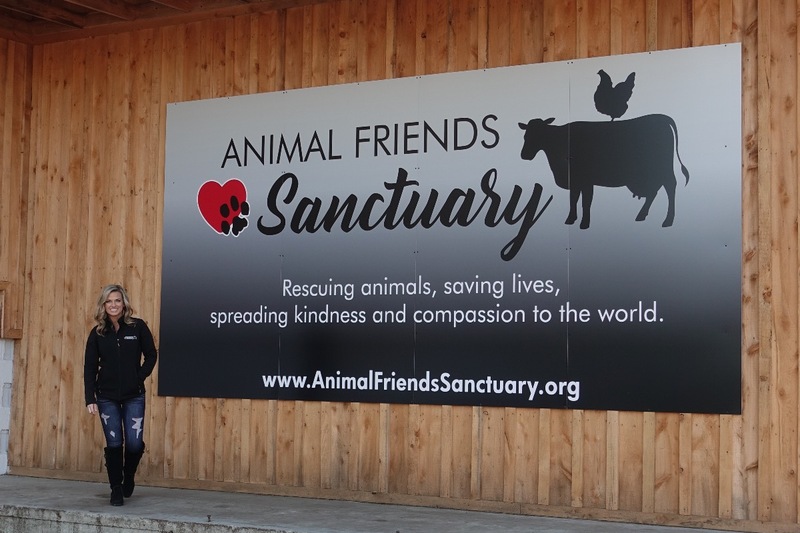 Animal Friends Sanctuary | Animal Friends of Westmoreland is a 501(c)3 organization dedicated to rescuing, rehabilitating and rehoming abandoned and abused animals. 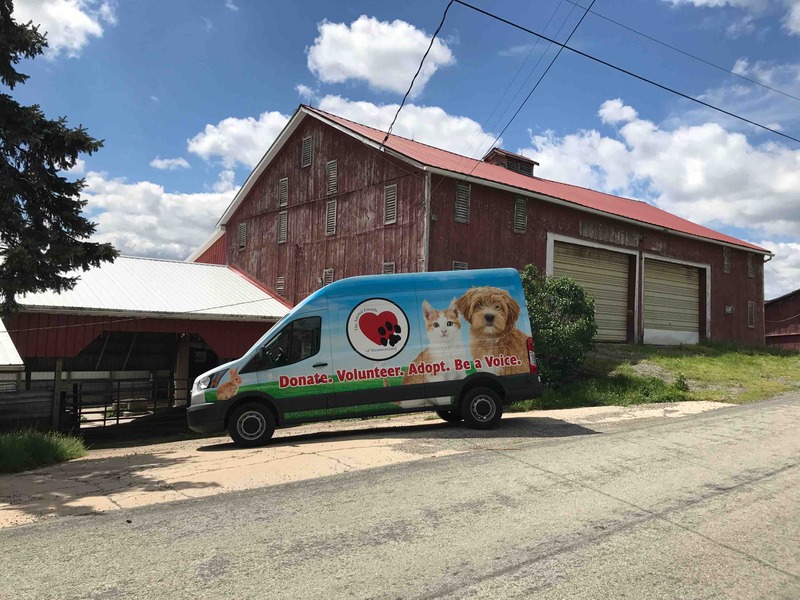 Founded in 2006 by entrepreneur & animal activist Candy Valentino is now a growing, thriving organization making a difference in the lives of animals across the country. It took 2 years to renovate the building Valentino donated. Almost 100% of the work was donated as well - with the help of volunteers and local businesses within the community. The Adoption Center opened its doors to the public November 2009 and to date, have saved over 5000 lives. The life saving work is done with only 5 paid staff and an army of over 250 active volunteers contributing over 25,000 hours to our mission and the lives of whom we care. We rescue animals and save lives. We provide love and joy to the humans who open their hearts to these animals and those who serve on their behalf as care givers within our organization. We stand up for the voiceless. We help animals and children remember that they matter. We inspire people to stand up and speak out against animal abuse. We encourage a community. We help children who have suffered abuse and neglect, find healing and gain trust as they relate to the animals who also share such horrific pasts. We remind the world that all lives matter. In 2017, Animal Friends of Westmoreland began the next phase of our journey. Our vision is to create an even bigger impact on the community, and leave a legacy for generations to come. With the purchase of a 62 acre farm, we are able to rescue large animals like horses, donkeys and cows as well as farm animals such as pigs, goats, sheep and chicken to name a few. We have space on the property to build a new Adoption Center that will provide safety and shelter to over 1000 dogs, cats and rabbits every year, almost tripling our capacity and impact from our existing location. The funds from this campaign is to complete our new ADOPTION CENTER which will triple our capacity to save even more than 1000 dogs and cats lives every single year; as well as the additional building needed to speak for all animals. We already purchased the property, renovated the exisiting barn and have amazing volunteers supporting our mission. We have all the pieces to make an even bigger difference in the lives of animals but out reach is confined by lack of space. Additionally, once the buildings are complete, we will be able to launch our program for at-risk and underprivileged youth. Children in foster homes, children that have been abused, neglects or abandoned themselves will be able to find safety and love as they begin to build trust relating to the stories of the animals that also share such horrific stories. Your support will mean the world to the animals' lives that are saved. It will end the abuse, the suffering and will spare their life. In return, the animals will pay it forward by demonstrating kindess and forgiveness; teaching children and humans everywhere the power of compassion and will impact future generations ending the abuse cycle and fostering a more loving, gentler world. Our Health & Wellness Clinic will provide on-site medical care for the abandoned, abused and neglected animals. Many of the animals that come to our shelter and sanctuary are very poor health and need immediate and at times extensive medical care. Having a facility on site will save the organization thousands of dollars a year by lowering staff time, transportation cost and overall medical and surgery expenses. It will also provide low cost spay & neuters to the community. Reduce expenses for pet parents also reduces the chances of owners surrendering their pets. Low cost community clinics also ensure more affordable routine vaccines and routine care which keeps animals happier and healthier. A gift at this level will give the donor naming rights to the Health & Wellness Clinic which will be prominently display on the entrance of the building and will forever be a part of our organization, impact and your legacy. Our Compassion Center will provide housing and care for the abandoned, abused and neglected farm animals. It will also be the home where we welcome the at-risk and underprivileged youth who are participating in our It's Cool to be Kind Program. A gift at this level will give the donor naming rights to the Compassion Center which will be prominently display on the entrance of the building and will forever be a part of our organization, impact and your legacy. A gift at this level will give the donor naming rights to the Horse Haven Barn which will be prominently display on the entrance of the building and will forever be a part of our organization, impact and your legacy. A gift at this level will give the donor naming rights to the Piggie Paradise which will be prominently display on the entrance of the building and will forever be a part of our organization, impact and your legacy. A gift at this level will give the donor naming rights to the Chicken City Coop which will be prominently display on the entrance of the building and will forever be a part of our organization, impact and your legacy. A gift at this level will give the donor naming rights to Goat Town which will be prominently display on the entrance of the building and will forever be a part of our organization, impact and your legacy. -Receive a PRIVATE TOUR with our founder or staff; or host a “Farm Boot Happy Hour". -Receive your name/ company name on one of the STALL PLAQUES in our new barn. This will become a permanent a part of the impact and legacy our organization will have for generations to come. -Receive NAMING RIGHTS for one of our rescued animals that will live out their life with kindness and love at Animal Friends Sanctuary. -Receive your name/company name will also be displayed on one of the STALL PLAQUES in our new barns. This will become a permanent a part of the impact and legacy our organization will have for generations to come. -Have your name/company name displayed on our Donor Wall which will be permanently displayed in our sanctuary. -Have your name displayed on our Donor Wall which will be permanently displayed in our sanctuary. -Receive a private "behind the scenes" tour of Animal Friends Sanctuary with one of our staff. -Receive a hand written thank you note, a photo of an animal that has been rescued and our signature "farm approved" vintage HOODIE! and our signature "farm approved" vintage HOODIE! I can't believe it's been two years! March 31, 2017 is a day that will forever be remembered in our organization’s history. 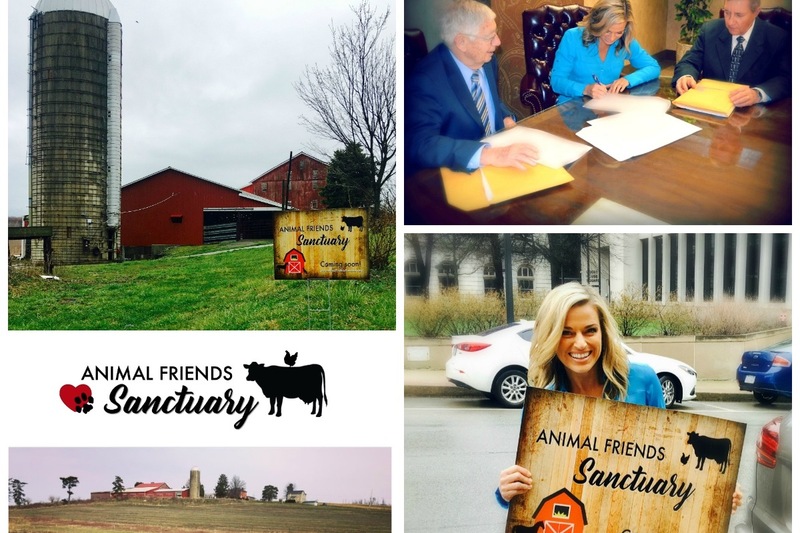 It was the day Animal Friends Sanctuary went from a dream to the start of a reality, as we signed the closing papers on our 62 acre property in Latrobe, PA. So much has happened over the last 2 years. We’ve renovated the existing barn that became home to the Sanctuary’s first residents. We welcomed amazing new volunteers to our organization who are committed to helping in our mission and providing love and care for the animals who call the sanctuary home. And most importantly, we have rescued dozens animals from life threatening and neglectful situations, and have given them a loving place to call home for the rest of their lives. Thank you to everyone for your continued support. Without you and your support, Animal Friends Sanctuary would still merely be a dream, and animals like William, Mary, Sharon, Leo and the others would not be alive today. 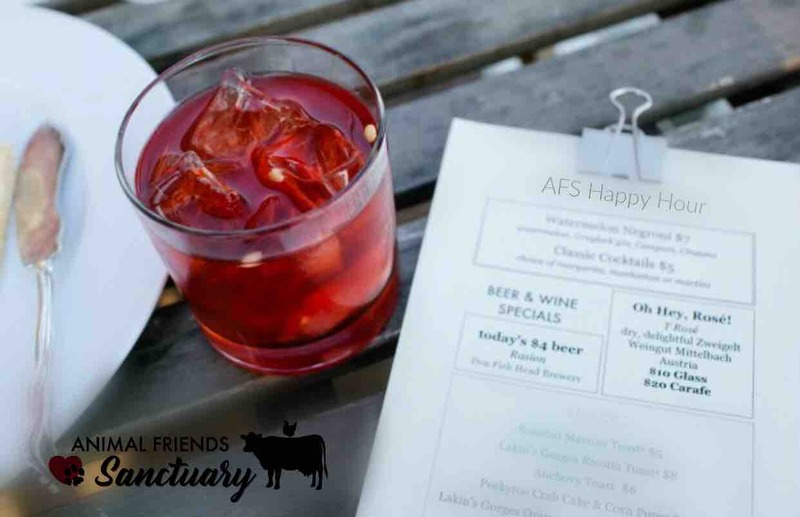 Happy 2nd Birthday, Animal Friends Sanctuary! We were honored to host a special guest as she toured the farm sanctuary today! GIFTING LEVELS are posted! Receive a GIFT from Animal Friends Sanctuary in honor of your generous support! This place looks like it will be wonderful for the animals! Farm animals definitely deserve our compassion, just like companion animals. Can't wait to see this project completed for them. THANKYOU FOR ALL THAT YOU DO! !